For months, The Guardian's Gary Younge has followed the rise and rise of the charismatic Minister Louis Farrakhan. His film report looks at just why the leader of the Nation of Islam is still barred from entering the UK. You have to do quite a lot to get banned from the United Kingdom. In the past few decades our country has played host to former Klansman, David Duke, former Apartheid leader, P.W. Botha and a pot-pourri of Europe's disdainful, right wing demagogues. So the Home Office ban of Minister Louis Farrakhan, the leader of the Nation of Islam, really does stand out as a particular and peculiar response to a particular and peculiar man. The fact that some would object to his politics is hardly surprising. He believes that if racial equality continues to be denied to blacks in America then there should be formal separation of races, giving black people their own state. Moreover during the mid-80s he made a series of inflammatory anti-Semitic remarks for which the Jewish community rightly and roundly condemned him. But their objection to his very presence in the UK is baffling. Why the 'heavies' for a peaceable man? He has never been convicted of any crime, nor have his words been associated with any violence against other racial groups. In fact, those who follow the Nation of Islam refer to a "crime-dampening" effect that the organisation has exerted in troubled urban areas where it has an influence. Over the past decade or so he has expressed regret for some remarks he has made and he's ceased to make others which are offensive to Jews and others. Indeed, his message on many fronts, including the holy grail of Black Nationalism - which stands at the centrepiece of the Nation's ideology, has mellowed considerably. Hispanics, native American Indians and poor whites regularly feature in his roll call of those with whom African-Americans have a common cause. They attend most open Nation of Islam events these days and you will see a smattering of white and Asian faces in the crowd too. He counts among his friends a white former Reagan economics adviser, Jude Wanniski, and the local white, Catholic priest in the South Side of Chicago, Father Micahel Pfleger. It goes without saying that he must accept responsibility for what he has said and done and should not expect that just because he has changed his critics must accept, forgive or embrace him. But likewise his critics must acknowledge that he has changed. To refute this is not only to fly in the face of all the evidence but to deny his ability to develop and evolve both personally and politically. 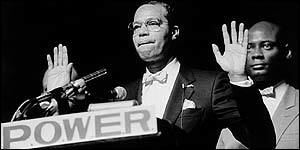 Here, in Britain, views of Farrakhan remain simple if not simplistic. To the British media he's the "Minister of Hate", the "Prophet of Rage" and the "Black Hitler". But in America, where racial segregation was outlawed less than 50 years ago and religion is the most segregate practice of all, his role is far more complex. No reasonable critique of Farrakhan can ignore why he has such currency within the black community, which goes way beyond the members of his organisation. And no conclusion can ignore that so long as the American political structure and economic system excludes such a sizeable proportion of African-Americans then a figure like him will draw strength from their alienation. Like them, he is an outsider and he trades on that status. With his bespoke brand of Islam he represents a religious community, which currently feels besieged - particularly after 11 September. And his militant racial rhetoric makes him a target for the Right. But his social conservatism with regard to family, welfare, homosexuals, women and crime alienates him from many progressives. For all sorts of reasons, Farrakhan is a problematic political figure. But it does not follow, that his presence would be a problem in Britain. Since there is absolutely nothing to suggest he would be a threat to public order, one can only surmise that the British government is actually banning his ideas. A dangerous step against a man who is most unlikely to present a danger. "It seemed the Jewish community in the UK utilised their influence to say that I was not a good person"
"Suppose you started teaching in your rap, knowledge the children need to know"
"We have a group of people who spend 40-60% of their income to finance the organisation"